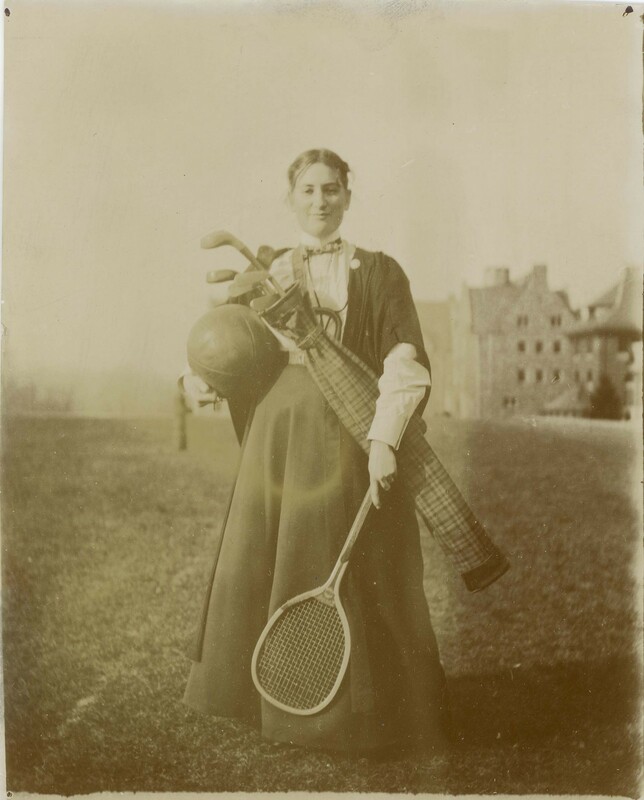 This early scholar-athlete, photographed in 1898, wears an academic gown and carries the equipment for three of the the most popular sports for women in her day: tennis, basketball, and golf. There is an intimate connection between women's literal freedom of movement and their access to education and to the professions; changes in educational and in physical culture appear to have gone hand-in-hand1. The combined efforts by visionaries in higher education like M. Carey Thomas and pioneers in physical education like Dr. Carolyn Ladd Hall, Dr. Bertha Foster, and Constance M. K. Applebee transformed the opportunities available to many women in the United States: educationally, professionally, and physically. 1. Collins, Tracy J. R. Physical Fitness, Sports, Athletics, and the Rise of the New Woman. Dissertation, Purdue University: West Lafayette, Indiana, 2007.